Deal Shopping Mama: Fluffy Slime Scented Stress Relief Toy 4-Pack-$6.49! Fluffy Slime Scented Stress Relief Toy 4-Pack-$6.49! 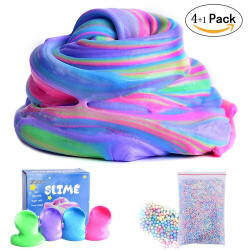 Amazon offers the Fluffy Slime Scented Stress Relief Toy 4-Pack for $12.99, use promo code "GM4D5MQP" to pay $6.49 with free shipping for Prime members! Deal ends August 22.